Cosmetic Dentistry Fresno - Fresno, CA Dentsit - Curt P. Posey, DDS, Inc. Which techniques should be used to improve your smile? 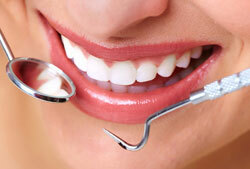 A dental exam in our Fresno, CA office will take many factors into consideration, including your overall oral health. Curt P. Posey, DDS, Inc. in Fresno, CA can brighten and rejuvenate your smile with our cosmetic dentistry services! Call (559) 227-6755 today to make an appointment!